Today is #FabChangeDay – a chance to celebrate the great work that is being done across the NHS, and to commit to actions bringing about improvement and positive change in quality and outcomes. Health and care professionals have been described as a force for change and resource for health. All Our Health is a call to action for all of us to practice in ways that focus on prevention and building resilience wellbeing as well as providing excellent treatment and care. All Our Health has been developed with health and care professionals to promote this message and to provide resources to support all health and care professionals to build prevention and health promotion into their practice. So perhaps a FabChangeDay commitment for you to consider is to take a look and think about how you can be part of this social movement. Take a look below to see how All Our Health helps us to think about what we can do to improve health for all! 66% of people with serious mental health problems will die prematurely due to treatable and preventable cardiovascular, pulmonary and infectious diseases. Poor physical health can also exacerbate the individual’s mental health issues. All Our Health’s topic on Wellbeing in Mental Health provides details on how health professionals can intervene to promote physical health and wellbeing. Imagine if every opportunity is taken across the course of care to check that all immunisations have been taken, that advice and support is provided to enable a healthy diet and encourage exercise, preventing the risk of diabetes, or an individual is empowered to give up smoking. There is no doubt many challenges will arise but All Our Health offers support and evidence and being aware of that evidence can we really neglect to make every effort to ensure the physical health and wellbeing of those in our care! As well as being the Associate Deputy Chief Nurse at PHE, I am also the National Lead for Cardiovascular Disease Prevention. Given that CVD is the second leading cause of premature death and ill health in England, there is an urgent need for colleagues to support our efforts in addressing this important issue. One example of action which all staff across the health and care system can do is to find out more about the NHS Health Check, which was introduced to help address the principle risk factors and conditions associated with CVD. All Our Health include an important resource on the NHS Health Check, detailing how everyone can get involved, such as taking up your offer and by promoting these checks within your local community. As we move into winter, we are bound to either experience or come into contact with infections and illnesses. Individuals with one or more long term condition can be additionally vulnerable and benefit from a range of protection measures. As health and care professionals, one action we should be taking is to ensure we are aware of the quick wins, i.e. washing our hands regularly, staying at home if poorly and being up to date with our immunisations, especially our annual seasonal influenza vaccine. More broadly, awareness of the principles of infection prevention and control, which includes antimicrobial stewardship and resistance (AMR), will equip us to understand and be able to convey evidence based messages to our colleagues, individuals, families and communities why we all need to focus on prevention. All Our Health has a dedicated topic on AMR which provides facts, core principles, resources and details on measuring outcomes and for making interventions. No matter where you work you have a role and responsibility to prevent and control infections and All Our Health can support you to deliver the best care possible. 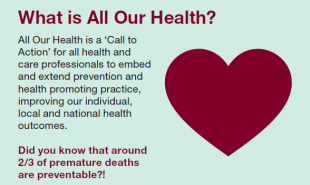 ‘All our health’ encourages health and care professionals to be champions for prevention and promoting health to improve our population’s health. A call to action encourages all health and care professionals to improve our populations health and as a public health intervention, Immunisation against infectious diseases has a great impact on population health, they are therefore professionals are key champions in this work. The UK routine immunisation programme aims to protect infants and children against vaccine preventable diseases from an age when they may be most vulnerable to infection. Educating families about the benefits of accessing childhood vaccination will provide protection to children and young people, and result in indirect protection to those around them, including infants, older people, and those in clinical risk groups. It is important to support parents in protecting themselves, children and their family against infectious and debilitating illnesses through accessing immunisations. Raising awareness about the benefits of immunisation provides the opportunity to discuss disease prevention and protection and allay any fears or reservations parents/ carers may have. Health and care professionals play an important role in empowering individuals and communities to protect themselves against infection. Flu vaccination is available every year to on the NHS to help and protect adults and children who are at risk of flu and its complications. The UK adult immunisation programme is available for certain people who are at higher risk of serious illness. Health professionals working in partnership have an important role in routinely providing immunisation information for parents/carers and are at the forefront of protecting the health of children during the early years within communities. Adolescence is a key period across the life course when health behaviours can occur with an increased risk to long term health. Promoting wellbeing and resilience in young people is key in reinforcing young peoples’ better health outcomes during this changing period of development. Working in partnership with the wider health system will support the role of the school nurse to ensure needs are met across many health disciplines. ‘All our health’ supports professionals from health and other services who offer universal, targeted and specialist care. For example, a school nurse can take an active role in addressing the emotional and physical needs of young people by offering an age appropriate PSHE programme. However, addressing individual needs of young people on such issues as emotional health problems, will require working closely with GP practices, CAMHS and also other AHP to ensure the best possible outcome for the young person. Oral health is essential part of a child’s health and wellbeing. In the 21st century no child should suffer from tooth decay, yet it remains a significant problem in this country, nearly a quarter of children (24.7%) starts school with tooth decay. Working in partnership with the wider health system school nurses and health visitors need to ensure many health needs of children are met and oral health remains at the forefront. Health visitors advise parents and carers on oral health prior to the first tooth appearing, they will encourage early attendance at the dentist and how to develop good practices in infant feeding, brushing teeth and general oral care. School nurses will work with individual and groups of school age children supporting them in taking responsibility for their own health needs. Developing understanding of how teeth decay and why reducing Oral health is an excellent area of personal care because everyone needs to take care of their teeth. Reduce the consumption of food and drinks that contain sugars and in particular avoid sugar containing foods and drinks at bedtime as well as asking for sugar free medicines if possible. Teeth should be brushed at least twice daily with a fluoride toothpaste last thing at night and on at least one other occasion. Parents should brush teeth as soon as the first primary tooth appears (at approximately 6 months of age) and continue to supervise children up to the age of 7 years when they brush their teeth. Visit the dentist on a regular basis, and take your child to the dentist as soon as their first tooth appears in the mouth. Public health is everyone’s business is a term that is frequently heard but rarely understood. For those of us who are new to the nursing, midwifery or allied health professions we may be unfamiliar with the term and what it means to us in our practice. All our Health provides a collection of resources that is both accessible and available irrespective of our location of study. It can be used as an educational tool to widen your knowledge, learn about the value of evidence-based practice and develop as a health promoting practitioner. The information is clearly divided into topics that are easy to navigate. Once you have located your chosen section you can be assured that the information will be in a format that is easy to read and understand. What’s more this information is based on current research and literature. It also provides links to the primary source of information so that you can read it yourselves. This will make public health an increasingly familiar term and will help you to apply the principles of prevention and health promotion to your practice in your chosen profession. Occupational Health nurses work in such diverse workplace settings and frequently in small teams or alone. It’s often hard to locate the information they may need to inform practice and ‘All our Health’ helps by providing key information about workplace health, links to key reports and to evidence based guidance. Occupational health is too often misunderstood by our colleagues and even those who use the service. All our Health provides an invaluable reference point for nurses wishing to enter the profession, for students embarking on a specialist course and for those already working in an OH role. It places workplace health firmly at the heart of population health.